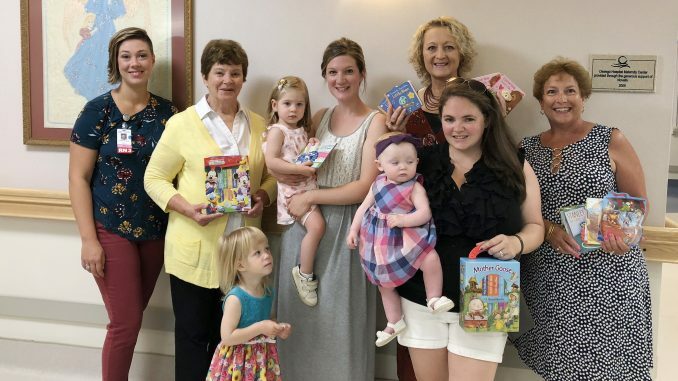 From left are: Jessica Leaf, RN, of the maternity staff, who assisted with the selection of books; along with Children’s Board members; Carolyn Barlow, Aria Leaf, Kathryn Watson, holding Adaline Watson, co-president Valerie Gerber, Caitlin Gilkeye, holding Charlotte Gilkeye, and Karen Reynolds. 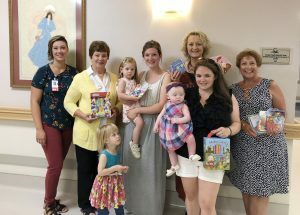 OSWEGO – Members of the Children’s Board of Oswego recently visited Oswego Health’s Maternity Center to donate baby books. The local organization’s generous donation allows each family to go home with a new book, to encourage lifelong reading. The Children’s Board donated books in both English and Spanish as part of an arts and culture initiative. 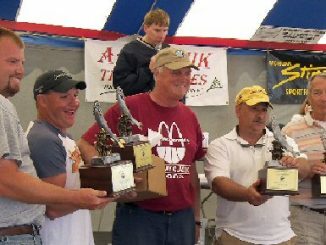 The Children’s Board, originally founded 80 years ago, is a community organization dedicated to enhancing the physical, emotional and cultural well-being of the children of Oswego County.